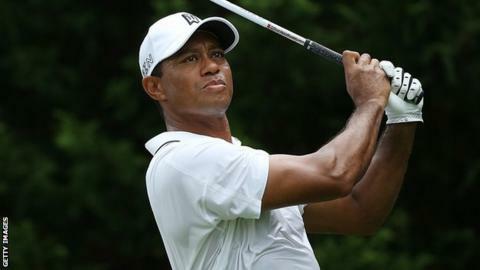 Tiger Woods shot four straight birdies on his way to a three under 68 in the first round of the Quicken Loans National in Virginia. The former world number one is five shots off joint leaders South Africa's Retief Goosen and Japan's Ryo Ishikawa. It was the first time Woods, currently ranked 266th, has shot four birdies in a row since the 2013 Bridgestone Invitational - his last tournament win. Meanwhile, England's Justin Rose is in contention after a five under 65. The 35-year-old bogeyed the second but five birdies through his next seven holes saw him climb the leaderboard. Rose added three more birdies after the turn, but dropped shots on the 12th and 18th. Compatriot Andy Sullivan is the best-placed Briton on six-under-par. The 29-year-old has risen to 53rd in the world this year after victories at the South African Open and the Joburg Open. Meanwhile, Woods's run of birdies - which started on the 10th and ended with a par putt on the 14th - came after he had bogeyed three of his first four holes. "That's what scoring is all about,'' Woods said. The 39-year-old, who missed the cut at the Open earlier this month, needs victory at the Robert Trent Jones Golf Club to secure his place at next week's Bridgestone Invitational.